Rhex ID (Trypan Blue sterile solution preservative free) 0.8 mg is a sterile solution of Trypan Blue solution (an acid di-azo group dye). 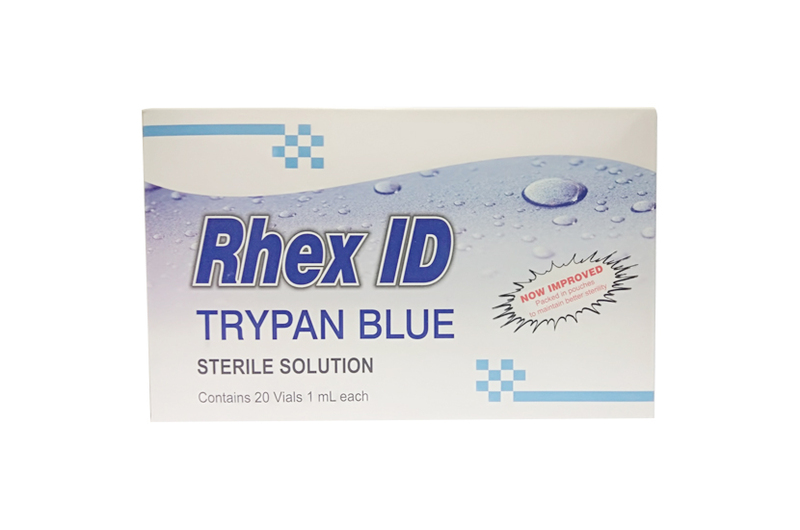 Rhex ID (Trypan Blue solution) is a selective tissue staining agent for use as a medical aid in ophthalmic surgery. Each mL of Rhex ID (Trypan Blue solution) sterile solution contains not more than 0.8 mg of Trypan Blue and 8.2 mg of Sodium Chloride in a aqueous buffered. It is a blue dye (Sodium ditolyldisazobis-8-amino-1-naphthol-3,6-disulfonate) used to stain capsules and has very low toxicity profile. It is available as a 0.1% solution. Rhex ID (Trypan Blue Solution) selectively stains connective tissue structures in the human eye such as the anterior lens capsule of the human crystalline lens. Rhex ID (Trypan Blue Solution) is intended to be applied directly on the anterior lens capsule, staining any portion of the capsule which comes in contact with the dye. Excess dye is washed out of the anterior chamber. The dye does not penetrate the capsule, permitting visualization of the anterior capsule in contrast to the non-stained lens cortex and inner lens material. Rhex ID (Trypan Blue Solution) is contraindicated when a non-hydrated (dry state), hydrophilic acrylic intraocular lens (IOL) is planned to be inserted into the eye because the dye may be absorbed by the IOL and stain the IOL. It is well tolerated though rare reports of post surgical inflammatory reactions and bullous keratopathy are reported. It is harmful if used systemically as it has been used as an experimental teratogen and may cause liver damage. General: It is recommended that after injection all excess Rhex ID be immediately removed from the eye by thorough irrigation of the anterior chamber. Carcinogenesis, mutagenesis, impairment of fertility. Rhex ID is carcinogenic in rats. Wister/Lewis rats developed lymphomas after receiving subcutaneous injections of 1% trypan blue dosed at 50 mg/kg every other week for 52 weeks (total dose approximately 1,250,000-fold the maximum recommended human dose of 0.8 mg per injection in a 60 kg person, assuming total absorption). Rhex ID was mutagenic in the Ames test and caused DNA strand breaks in vitro. Do not use the products after the expiry date. It is available as 1 mg single use vials. Each ml contains 0.8mg trypan blue. It can be injected in the anterior chamber ideally under air bubble and is allowed to stay for a minute to allow staining before removal. Rhex ID is packaged in a 2.0 mL glass vial in sterile pouch. After opening the eye, an air bubble is injected into the anterior chamber of the eye in order to minimize dilution of Rhex ID by the aqueous. Rhex ID is carefully applied onto the anterior lens capsule using a blunt cannula. Sufficient staining is achieved as soon as the dye has contacted the capsule. The anterior chamber is then irrigated with balanced salt solution to remove all excess dye. An anterior capsulotomy can then be performed. 1 ml solution (TRYPAN-BLUE SOLUTION) filled in 2 ml glass vial packed with printed labelled pouch & cartons And Such Carton Packed in a corrugated shipper box.